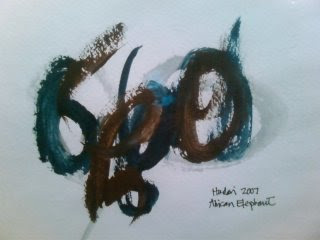 This is a painting made by an elephant. Yes, that kind of elephant. The elephants at the Nashville Zoo paint to help pass the time. Apparently it keeps them happy. I thumbed through a selection of original pieces at the zoo's gift shop and I was really taken aback at how cool some of the pieces were. I should have taken pictures. But if that weren't cool enough, apparently they have elephants in Thailand that also paint- and several of them are quite accomplished. Check out this painting. And in case you think it's all rigged, nope. So why am I going on about this? If you read up on how they paint it's pretty clear that they are following through on a good deal of training. It does seem like they enjoy it, though. But a quick look through the gallery linked above shows that different elephants made the same kind of paintings with the same tone and motive appear over and over. A pattern emerges and we can see the trainer's hand at work. The animals were given certain 'principles' of how to achieve a given subject and then through positive reinforcement learned to repeat the results. 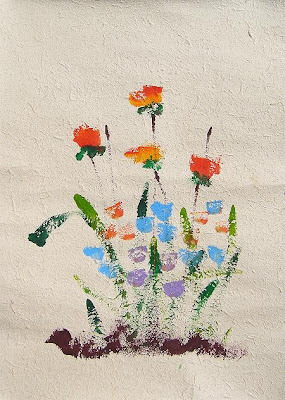 Sweeping lines for an elephant, vertical green lines and orange pokes for flowers, etc. I still think it's really cool (my cat can't do this), but I just can't make the jump to say that the elephants are expressing something artistic in themselves. Maybe they are, but it seems to me to be the product of a lot of training to make paintings for people to buy and like. But how is that much different than us and our 'principles' and 'rules'? Modern western animators might not be that far removed from approaching their work like these trained elephants. The hegemony of the classic 'west coast film style' of animation (Disney in 2d, Pixar in CG, et al.) can be suffocating in it's near soviet insistence on conformity. We need to guard against letting our definition of what makes 'good' animation grow smaller and smaller. Watch a film like John Canemaker's "The Moon and the Son" and you'll see a fantastic example of expressive animation that is nothing at all like the dominant west coast film style. That style is good and has a place, but to me it's not terribly personal. It sells DVD's, though, and so we learn it (and in my case, teach it) to make a living. But I like stuff that possesses a personal voice for expression that is not leather bound by the strict adherence to a list of rules and principles. And more than any other medium CG suffers from a built in level of conformity that crushes independent style. Overcoming that oppression in CG takes far more effort than any other form of animation, in my opinion. Marc Craste is an example of a CG animator who has crafted his own style- one that doesn't thumb its nose at principles, but at the same time isn't stifled or bound by them. It would be good if more of us would find a way to rise above the overtly produced results that aren't that much more expressive than what a trained elephant can accomplish - yours truly included. Before you get your flamethrowers warmed up, I'm here to say I like where things are going over at DW land. At first DW tried to do the Disney thing. They had limited success. They found that 900lb. gorilla really difficult to unseat. But with Shrek we saw DW's first big breakout hit. The general idea was to spoof two things- fairy tales and Disney. It did a servicable job of both, and raked in a ton of cash to boot. One of the core techniques in the film was the use of the 'pop culture reference'. Similar to TV shows like Family Guy or Disney's earlier Alladin, the idea is to make some obscure (or obvious) and subtle (or blatant) reference to some aspect of current (or relatively recent) popular culture. DW developed a real love for this idea. It was evident in just about every film following Shrek. The zenith of this approach was Bee Movie, a film that was really hard for me to sit through. It was a goofy patchwork narrative that filled the few cracks between a littany of pop-culture gags. But with Kung Fu Panda I noticed a switch in tack. 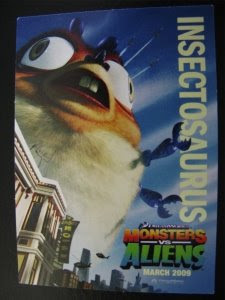 As I see the premise and approach for the upcoming Monsters vs. Aliens I see that maybe they are taking this pop-culture idea to the next logical level. They seem to be evolving from using pop culture reference as disparate gags in a film to using the film as one big pop culture reference. KFP spoofed the 1970's Kung Fu film genre, and did a pretty good (and fun!) job of it. Monsters vs. Aliens looks to spoof the 1950/1960's B-movie monster flicks. If it handles the subject as well as KFP handled its subject I think they may be on to something. In the end I think their efforts with the pop culutre reference spoof movies may be a more palatable and successful venture than just sprinkling in pop culture references in an otherwise non-pop movie. The biggest complaint about pop-cult references in a film is that they seemed forced- jammed in by unimaginative execs to get cheap laughs. It's a pretty fair assessment, I think. They often just break the flow of the narrative, resulting in a jangly effect that sounds just a little bit off. It's like jingling a pocket full of real coins mixed with a few Chuck-E-Cheese tokens. It jingles, but there are some notes in there that are most definitely off key. However by making the entire film one big pop culture reference they seem to be onto something that works better. The key appears to be keeping any pop culture references in these newer films germaine to the genre being spoofed. In other words, if KFP had some kind of gag revolving around a Chinese Kung Fu version of Wal-Mart or American Idol or something similarly indicative of the decline of civilization, then that would have sucked majorly. But if they remain sly and clever and true to the genre and period spoofed they stand a great chance of maintaining a cohesion between their films and gags that they haven't yet truly enjoyed. Some may argue that the effect is like jingling a pocket full of Chuck-E-Cheese tokens, but you gotta give them marks for at least getting all the notes to sound cohesive. I, for one, am looking forward to seeing if they can keep the ball rolling with Monsters vs. Aliens. If nothing else you have to give props to DW for striking and and trying different things, every bit as much as (maybe even more than) Pixar/Disney. 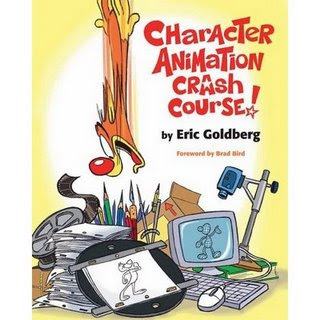 Don't let you pursuit of knowledge about animation (especially the nuts and bolts of how to do it, etc.) obscure your childlike imagination. And certainly never let it frighten you into never trying to do the unknown. And by 'unknown' I don't mean a universal unknown (ie: no human has ever tried or understood this thing you're confronted with). Rather I am talking about your personal universe- what is known and unknown to you. Students so often get caught up in trying to expand the size and scope of what they know. Thus the focus on principles, techniques, methods, etc and the quixotic quest for rock solid formulas and rules that will always work in any situation. 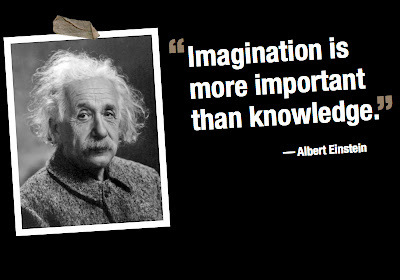 The problem is if you're not careful that pursuit for knowledge can drastically shrink your world. Use your imagination to prop open the windows that look out over the wide expanse of the unknown. Try something - anything- that you don't know how to do. Jump and see what happens. If all you ever do is what you know how to do then you become small and limited. The key is to understand the fundamentals without letting them turn you into a fundamentalist. Keep an open mind about how to accomplish different things. Don't be afraid to try something that you've never tried before. And be especially willing to try something where you don't have the faintest clue about how you're going to do it. Once you do that then you have no choice but to unfurl the wings of your imagination and try to fly. A quick update on the current Animation Personal Trainer session (#4 so far). We have 10 new students (plus one left over from a previous class). We're only one and a half weeks into the session and I'm having fun! This class has some talent and loads of potential.. It's a great mix of students. The first few assignments that have come back are looking solid. I can't wait to see how they improve by the time we're done. What does this have to do with you? Well, to put it simply- I'm going to have another APT session not too long after this one wraps up in mid-August. After nearly a year hiatus, this latest class filled up in 25 minutes. Since then I've received quite a number of emails from folks who were disappointed that they missed out and they wanted to know when the next session will be. So if you really want to participate in the next APT, be sure to keep an eye out here for info sometime in the next few weeks. The Garbage Plate from Nick Tahoes Restaurant in Rochester NY. I dare you to eat one sober. A lot of animators on high footage projects (DVD, games, TV, commercials, etc.) often complain about the limitations of time and budget. And true enough, those limitations do exist. You only have so many dollars, so many days and so many animators. You're often not given a lot to work with. But then it's up to the animator to think outside the box. What one added ingredient or what one change in the way you present the scene would make the simple and plain into something pleasing and satisfying? After all the only difference between bread and toast is a little heat and some butter. 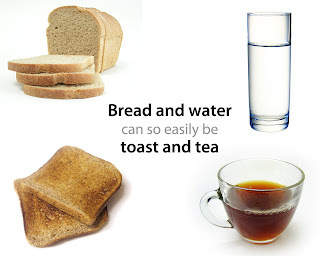 What can you add to your scene to elevate it from bread & water into tea & toast? I finally have a good reason to check the mail each day as I wait for this to show up. A little anecdote- about two years back I posted some Eric Goldberg notes on my blog that I got from Tim Hodge- which he got from somebody at Disney. Anyhow, a member of Eric's family (I think it was his daughter, can't remember now) emailed me and very sweetly asked me to take the notes down. The reason? Eric was writing a book! I was more than happy to take down the notes knowing that this genius of animation was writing a book. And now it's supposed to be shipping this month. Yay! In the spirit of the presidential election this year, I have decided to add polls to my blog. Why? Because I said so! 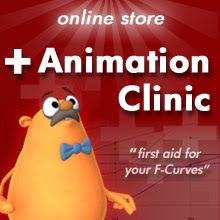 It's been a while since I've really followed the online animation blogo-fest seriously. How long? Like, oh... a year? Anyhow I've slowly and intermittantly been toddling my way back into things, catching up on various musings from my old feed-list. One of my favorite animation bloggers, Mark Mayerson, has a very insightful review of Wall-E. There's spoilers in it, but if you've seen the film and want to read his erudite take on the topic, then I highly suggest that click here. And do it, like..um.. last week. Yeah. One of the casualties of the switch to a new blogging system was my free animation tutorial named Do Me a Favor...Favors, Eases and Other Mysteries of Space. Well the tutorial has been rescued, cleaned up and given a new set of shiny shoes. Check it out here at its new home. Thanks to those who wrote to let me know of the broken link. Spending a few days with family in the upstate NY area t celebrate Independence Day. I'd forgotten how pretty this place can be. But I'd also forgotten that it's also chilly here at night! The tropical Brazilian climate really thinned out this boy's blood. Last weekend the Lango Crew made its way to the big cineplex to take in Pixar's Wall-E. Nice film. Very charming, great character development, funny as well. Check out Tim Hodge's take on it. His thoughts aren't too far from my own, but I think he was expecting it to be something more than I was. For myself, Wall-E was what I expected it would be so I wasn't disappointed or anything. My wife really enjoyed it due to the love story side of things. So I think Pixar has officially made the first CG chick-flick. Heh. But my kids still quote Kung Fu Panda lines. On a housekeeping note here: There were a few bugs in the new online store regarding subscribing to the VTS. If you tried to subscribe in the last week but found it wasn't working correctly, try it again now. Everything should work.